At the climax of Now You See Me, a barrage of brief shots skips back in time to show how our quartet of magicians pulled off the complicated illusion we’ve just seen. (A very, very complicated illusion, in fact. You and I should be so lucky.) Soon our Four Horsemen come to realize that a puppetmaster behind the scenes has been steering them, and this awareness comes in another flurry of flashbacks. Today’s movies are constantly using fragmentary flashbacks to fill in elements left out of earlier scenes. I recently considered how Safe Haven and Side Effects use the convention, but lots of other films will furnish examples. Crucial to this technique is an illusion created by cinematic narration. The first time through a scene, we think we’re seeing everything. But the replay shows us bits and pieces that were left out, or that we didn’t notice, or that we’ve forgotten about. Back in 1992 I wrote an essay about this technique. 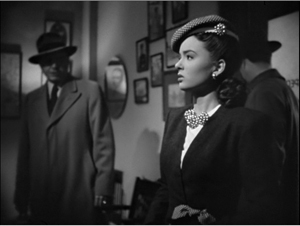 “Cognition and Comprehension: Viewing and Forgetting in Mildred Pierce” focuses on the murder of Monte Beragon in the 1945 film. A revised version of the essay appears in Poetics of Cinema and is now available on this website. The piece tries to show that a cognitive approach to comprehension and recollection can explain how a film shapes viewers’ responses—in this case, creating mystery while making viewers forget certain things they’ve seen. Today I’m going to consider Mildred again, but by doing something I couldn’t do in print. The wonders of the Internetz let me use video extracts to show concretely how clever this replay is. I frame my case here differently than in the earlier piece, although there are ideas and examples common to both. Perhaps what I do here will tease you into reading the more technical essay. And of course there are spoilers—most thoroughly in reference to Mildred, more mildly in reference to Side Effects and The Unfaithful (1947). 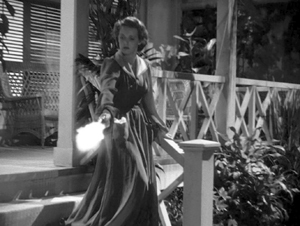 At the start of Mildred Pierce we see Monte shot down in a beach house, but we don’t see who did it. 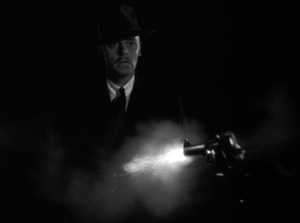 At the climax of the film, we’ll see a flashback replay the murder, filling in elements that were suppressed in the earlier version. 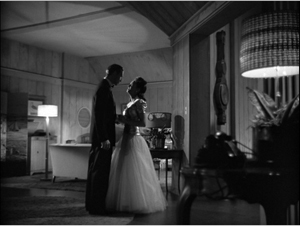 In these sequences, director Michael Curtiz and the film’s screenwriters make choices about at least three narrative conventions. How do you present the original scene? How do you handle the flashback? How do you present the replay? These choices confront every screenwriter or director who wants the Aha! effect of dramatically revealing what was really happening in an earlier sequence. The filmmakers’ decisions will be shaped by the urge to make the audience’s pickup fast and effortless. The filmmakers know that we tend to want to cut to the core of a story situation, to grab its gist and move on, and we trust that the film’s unfolding will help us do that. But this very speed can work against us. By counting on our knowledge of conventions, filmmmakers can encourage us to jump to conclusions that will turn out to be inaccurate. Start with the handling of the original scene. Your choices are basically these: We can see the action fully, or we can see it only partially, with some aspects suppressed. Consider the opening of The Letter (1940). Leslie Crosbie strides out of a cottage, blasting away at a man who tries to crawl away from her. We see the crime fully, so the mystery involves circumstances. What led up to this murder? The rest of the film’s plot will concentrate on that. Alternatively, some element of the initial scene can be omitted. This is what we get in the shooting of Miles Archer near the start of The Maltese Falcon (1941). It’s familiar territory. 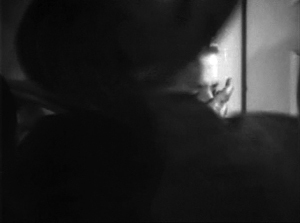 The film’s narration conceals the identity of the killer by framing him or her out of the shot. The question of who killed Archer will propel part of the action to come. The crucial action can be suppressed even more thoroughly. 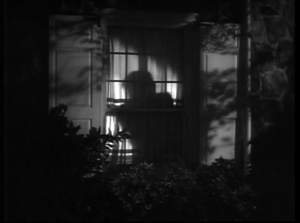 In The Accused (1947), a woman is followed into her home. We already know her as a wealthy wife waiting for her husband to come home, but we aren’t shown the identity of the shadowy male figure who grabs her and forces his way into the house. And the camera stays obstinately outside while someone is shot in the house. Only later will we find out who the victim is, and the entire film will slowly reveal what really happened inside, and what led up to it. I’ll have some things to say about Mildred’s initial murder scene shortly, but now let’s consider the second key convention: the flashback device itself. What is a flashback? Most basically, it involves presenting earlier story events in the midst of later ones. It’s often motivated as a memory, as when a woman recalls her childhood. But there doesn’t have to be a memory motivation; the film’s narration can directly show us bits of action that occurred in the past (as in the “objective” flashbacks in Kubrick’s The Killing). 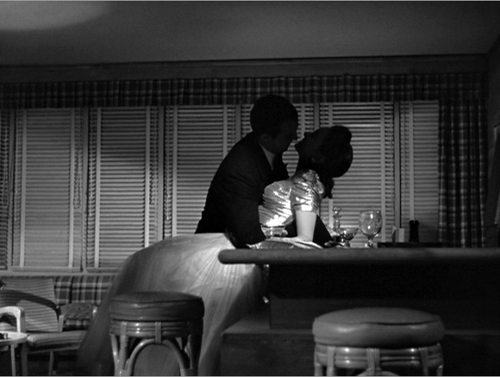 Mildred Pierce is built on three flashbacks. Two long ones explain the course of her life with her family, and a final one dramatizes Mildred’s explanation of what happened during Monte’s murder. What, then is a replay, the third convention I’m considering? I don’t think critics and filmmakers have a very stringent sense of this device. (See the codicil for further comments.) I’d suggest that basically a replay is a flashback that revisits scenes we’ve already seen. When our heroine recalls her childhood in scenes we didn’t see before, we have a flashback. But if later in the film we see those childhood scenes again, I’d call it a replay. Centrally, a replay revisits scenes we’ve already witnessed, or at least glimpsed. So not all flashbacks are replays. Are all replays flashbacks? Some would say yes, but I’m more cautious. I’m inclined to say that a mechanical recording of a scene shown earlier could count as a replay without being a flashback. In Rebecca the newly-married couple watches home movies of their honeymoon. This scene fulfills the function of a flashback, but the action we see remains in the present: the couple are screening the film. The footage doesn’t show scenes we’ve already seen, but if it had, I’d call the screening of the movies a replay, but not a flashback—since, again, the action framing it is visible in the present. This sort of mechanical recording/ replay is very common in modern films, reflecting the ubiquity of surveillance cameras, cellphones, and the like. In an earlier blog entry I talked about a purely auditory replay in Sudden Fear that’s made possible by an audio recording device. It would be odd to call the home movies or the SoundScriber playback flashbacks. So some replays are flashbacks, and some aren’t. When they’re flashbacks, replays are often used subjectively, as when a character remembers an earlier action. Recall all those dream sequences that present, often with distorted imagery or sound, action we’ve seen previously in the film. But a replay may also supply new information about actions we already witnessed and thought we understood. We thought we grasped an earlier scene because nothing signaled to us that pieces of information were missing. This possibility goes to another creative option. Sometimes the film tells us that something has been omitted. 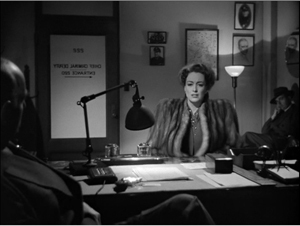 In my Maltese Falcon and Unfaithful examples, the narration is openly suppressive: It announces that it’s not telling us certain things. This of course adds mystery to the plot. The Mildred flashback shows that the initial scene was doubly tricky. It conspicuously hides information about the killer, and it inconspicuously hides other information about the circumstances. So the climactic flashback fills in information of both sorts: Who did it, and what really happened in the beach house parlor. The obvious suppression of the killer’s identity distracts us from the covert suppression of other items. So now come the real spoilers. We start with two establishing views of the beach house, with a car outside. Over the second, gunshots are heard. 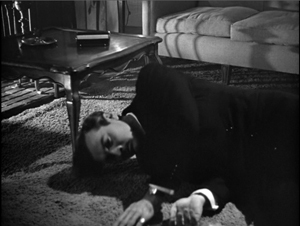 Shot by an unknown assassin, Monte staggers forward and falls back onto the carpet. A close shot shows him saying, “Mildred” as he dies. The camera tracks to the bullet-riddled mirror and we hear the sound of a a door. A new shot lingers on Monte’s corpse. We then see the car drive off. The next scene shows Mildred pacing nervously on the pier. I think that this opening lays out two options, one for the trusting viewer and one for a more skeptical one. The trusting viewer assumes that Mildred killed Monte. He seems to glance at her as he speaks her name, and the shot of the car pulling away leads smoothly to the sequence showing Mildred on the pier. Not so fast, says the skeptical viewer. If Mildred did it, why doesn’t the film show her doing it, as the Letter scene does? 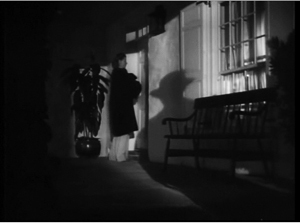 The absence of a reverse shot of the killer resembles the missing reverse shot in the Maltese Falcon scene. So the scene leaves some doubt about whether Mildred is guilty. The film rushes us along, so we aren’t obliged to decide one way or the other. Eventually we can reconcile the opening with either possibility. If Mildred turns out to be innocent, we can say the film played fair by not showing the killer. If she turns out to be guilty, the missing reverse shot will be seen as simply a device to postpone telling us. She certainly acts guilty enough in what follows. On the pier, she seems to consider leaping into the surf, only to be put off by a cop on a beat. The lubricious Wally lures her into his tavern, where she stares coldly at him before suggesting they go to the beach house. There, she locks him in, and he discovers Monte’s corpse. Passing policemen in a patrol car see Wally break out of the house and arrest him on the beach. 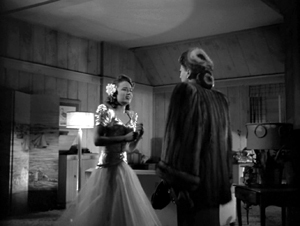 Mildred’s daughter Veda is briefly introduced at their home, when two policemen come to take Mildred in for questioning. She seems to feign ignorance of Monte’s death, still trying to frame Wally. At the headquarters, the police inspector announces that they have the killer—not Wally but Mildred’s first husband Bert. Distraught, she claims Bert is innocent and to exonerate him she tells her story, taking us through her two marriages and her successful career. At the climax of Mildred’s second flashback, she realizes that Monte’s free-spending ways have enabled Wally to cheat her out of her restaurant chain. 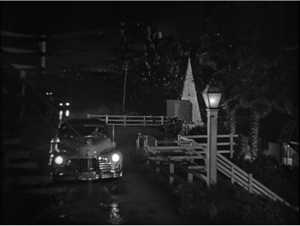 She fetches a pistol and drives to the beach house, in a framing that reminds the first-time viewer of the film’s opening shots. We see her walk through the house, but then the flashback breaks off. We’re taken back to the present, with her talking to the chief detective. “Monte was alone, and I killed him.” The detective replies that she’s lying; someone else was in the house. Who? Not Bert but Veda, brought in by the cops who have grabbed her when she tried to leave town. Before Mildred can hush her, Veda snaps out, “You promised not to tell! You promised! You said you’d help me get away!” Veda became increasingly important to the plot as the years went by in Mildred’s flashbacks, but her almost total absence from the opening minutes blocks our thinking of her as a candidate for the killer’s role. Soon we’ll see the pains the narration took to make sure we didn’t spot her at the crime scene. 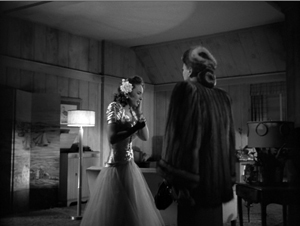 Mildred breaks down and launches the final flashback. The flashback crosscuts between Mildred in the car and what’s happening inside, bringing us back to the opening situation. Now the skeptical viewer’s hunch is borne out. The replay starts as a faithful version of what we originally saw, providing the reverse shot of Veda that was missing in the opening. This time we don’t see Monte hit (that action is covered by the shot of Veda), but he crumples and staggers forward as before. He dies, still murmuring Mildred’s name. Mildred hurries in, finds her daughter standing over Monte’s body, and succumbs to Veda’s demand that she cover for her. The replay explains why Mildred contemplated drowning herself afterward: She was in despair at the couple’s treachery and the crime that Veda committed. When suicide was blocked, Mildred tried to frame Wally for the murder in order to protect Veda. And the replay suggests that it’s not Mildred but Veda who drives off from beach house, leaving Mildred to drift down to the pier. At least, that’s what most viewers would remember as happening. My essay argues that it’s just this broad effect that the movie aims for: we recall the gist of the murder situation, and we assume that the only gap in it is the identity of the killer. However, when we look more closely at the two sequences, we see that Curtiz and his colleagues have covertly concealed a lot more. There’s a lot of sleight-of-hand here. The extreme long shot of the beach house and driveway (A-1) seems to set the stage. The car appears empty. By the time of the gunshots (first heard in A-2), though, based on what we know from the second flashback, Mildred must be in the car already. So you could argue that the dissolve to the long-shot of the car (A-2) conceals Mildred’s departure from the house and her efforts to start the ignition (B-1). I’ve wedged that later shot into the synthesized version to show the possibility. Otherwise we must assume that the initial shot of the whole landscape (A-1) follows her going into the car (B-1). Yet in that shot or the one that follows (A-2), we don’t hear or see the driver trying to turn over the engine. In either possibility, these opening shots display the sort of subterfuges that the film will execute more significantly soon. The presentation of the action inside the beach house misleads us from the start. 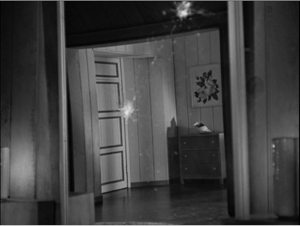 After Monte is shot, over the image of the bullet-pocked mirror (A-4), we hear a door, apparently closing. Because we don’t see anyone, and we assume that a murderer flees the scene of the crime, we infer that it’s the sound of someone hurrying out. In the replay, the door’s sound is linked to Mildred coming in (B-5), not leaving. Moreover, the filmmakers have played with the duration of the first scene to an almost criminal extreme. 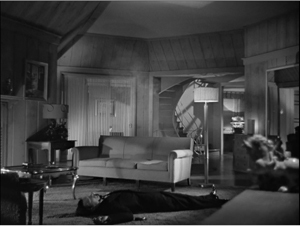 After the shot of the mirror and the sound of “departure,” a straight cut takes us to a peaceful but ominous long shot of Monte’s corpse in the parlor (A-5). But this shot doesn’t reflect what happened right after the murder (B-5 through B-10). When the door opened and shut, Mildred came in and immediately started talking with Veda. 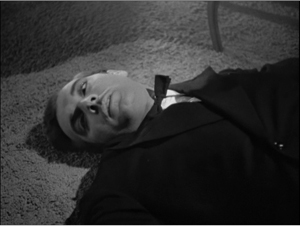 The shot of Monte’s corpse, if it has any place in the chronology of the scene, belongs later, evidently after Veda and Mildred have left the parlor but before Veda has driven off (A-6). In other words, version A has presented a big ellipsis—unmarked—between the mirror shot (A-4) and the shot of the dead Monte (A-5). All the drama between mother and daughter played out in the B version has been skipped over, without any hint that it was suppressed. 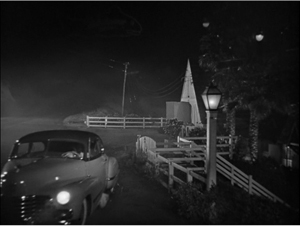 The sequence proceeds by degrees of sneakiness: First, the misleading presentation of the car and the beach house, then the teasing offscreen sound of the door, then the more forcible skipping-over of the conversation. Now consider something even more flagrant. When Monte says, “Mildred,” he says it in two different ways in the two sequences, and thus creates two different effects. 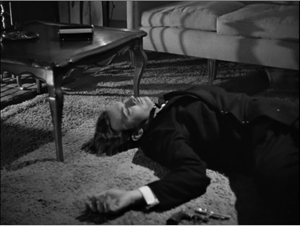 In the opening scene, an abrupt medium shot (A-4) stresses the line as the dying man’s last word. 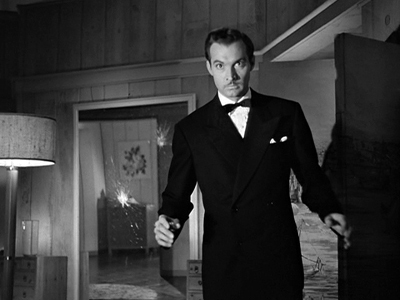 We know (especially after Citizen Kane) that last words are important, and Zachary Scott dwells on it, lolling his head from side to side glancing leftward, as if he were naming his offscreen killer. But in the replay, when Monte falls (B-4), he simply slumps to one side, head down, and mutters, “Mildred,” before flopping over on his back. Nor does Curtiz provide a closer shot. Now the line is tossed off, as if Monte were simply remembering his wife in his final moments. In sum, the replay not only fills in missing information; it corrects the inferences we made during the first scene. 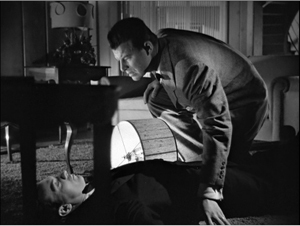 Of course, the film’s narration had encouraged us—at moments, forced us—to make those inferences, all with the purpose of creating a false impression about who was in the house when Monte died. You might object that these “rewritings” of the opening show less skill than we expect today. Films like Go (1999), One Night at McCool’s (2001), and Vantage Point (2008), let alone Now You See Me and Side Effects, strive to make the fragmented replays of an event dovetail neatly. But those films have been made in an era when people had the ability, on DVD, to rewatch films closely, and persnickety viewers can check for disparities. 1945 viewers couldn’t undertake the random-access probes into Mildred that we can. Moreover, as complex flashback storytelling became more widespread in the 1990s and 2000s, I suspect that there was a certain professional pride in making the sequence of events watertight. More generally, Curtiz and company could be confident that very few members of their audience would recall the fine detail of a scene shown a hundred minutes earlier. I argue in the essay that as the film unrolls, the rapid pace of the action and our inability to stop and go back allows the filmmakers to juggle time, space, and the sequence of actions played out. The filmmakers count on our inability to recall fine detail. How fine? If the replay had shown Monty falling face down rather than rolling on his back, I suspect that we would have noticed the disparity. But even trained critics, as I show in my essay, at the time and afterward, didn’t notice the smaller details that deviate from the initial scene, especially the point at which Monte says, “Mildred.” Curtiz and his screenwriters have worked comfortably in a zone of fuzzy recall. The differences between the initial scene and the replay can’t be put down to clumsiness or accident. All the disparities in the opening nudge us to draw the wrong conclusions, whether we play the trusting viewer or the skeptical one. The omission of the reverse shot, the most obvious mark that Mildred might be innocent, is a convention, as we’ve seen; but the other tactics pursued by Curtiz and company are more innovative. The filmmakers have exploited our tendency to jump to conclusions and to ignore details, always in our search for the gist of the story. In other words, filmic storytelling often takes advantage of mistakes we make in normal thinking. It even encourages us to make them. Thanks to Erik Gunneson for preparing the extracts for this blog entry and to web tsarina Meg Hamel for posting the essay. 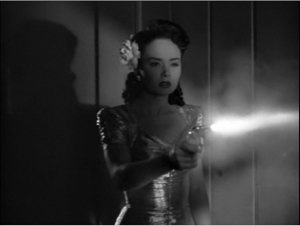 The misleading narration of Mildred Pierce has its parallel in crime fiction, particularly the thrillers of the 1940s. See this entry on the site for more background. A Ruth Rendell novel, Wolf to the Slaughter (1967), contains a boldly misleading opening that is somewhat similar to what happens in our film. Some details in the presentation suggest that Curtiz has played fair. In A-6, the woman driving off seems to have a light-colored coat, not Mildred’s heavy fur one. A viewer seeing Mildred on the pier might doubt that she took the car. Still, I don’t think everything here is perfect. Close examination of a 35mm print seems to reveal a figure in the passenger seat of the car ducking down in A-2. And does Monte, falling to the floor in A-3, move his lips slightly? Did the scene as shot have him speak the line “Mildred” at that point, as he said it in the flashback? If so, did someone decide later on the insert (A-4) that underscores his last word? 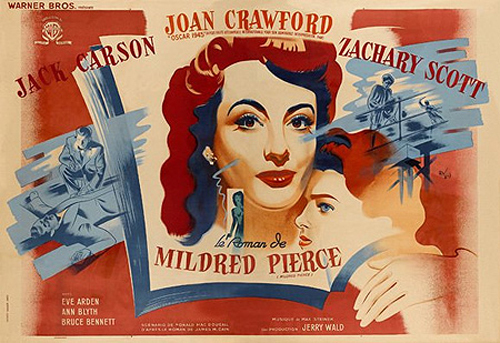 For more on the planning of this scene and the overall production of the film, see the screenplay Mildred Pierce, ed. Albert J. LaValley (University of Wisconsin Press, 1980). You can sample some of LaValley’s enlightening introduction here. The opening scene of the screenplay is quite different from that of the film, but it does retain the false clue of Monte seeming to name Mildred in his death throes. The narrational maneuvers on display here have counterparts throughout the 1940s, which is one reason I’m interested in that era. For more examples, see this synoptic entry. The critic Parker Tyler has some provocative observations on the film in Magic and Myth of the Movies (Secker & Warburg, orig. 1947), 193-205. 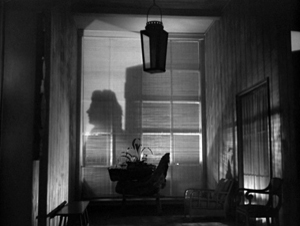 His comments suggest how difficult it was for audiences of the time to recall exactly what had been shown: he speaks of “the sequence of camera shots in which we see the outside of the house, the woman’s figure (or was it two figures, separately?) leaving it, her ride in the auto, her walk on the bridge, her impulse to leap over…” (195). This is a good example of the constructive tendency of memory: We fill in and seem to remember things that didn’t happen. A more theoretical point: Some people might say that it’s unhelpful to use the term “replay” to cover both one type of flashback and the mechanical capture of earlier action. Maybe we want to call these mechanical recordings “rerun” or “playback” scenes and reserve the term “replay” just for flashbacks, the dramatized renditions of the scene’s images and/or sounds. Perhaps a close look at The Conversation would allow us to sort these concepts more exactly. In addition, I’ve used the term “replay” to refer to those do-over plots that we find in fantasy and science-fiction films like Groundhog Day, Déjà vu, and Source Code. Yet you could argue that given the parallel-universe premise of these films, each event is shown in its singularity, in a distinct time frame. The scenes we see aren’t revisitings of a single event, but rather different events. They merely seem like replays because they repeat certain features of events that have occurred in other dimensions. I guess we need some new terms!”Reset” or “reboot” plots? Speaking of terms, narrative theorists will recognize in Mildred’s replayed flashback what Gérard Genette calls a paralipsis. Here the narration “sidesteps” an element during the initial presentation and later revisits the situation and fills in the information. See his Narrative Discourse (Cornell University Press, 1983), 51-52. A last musing: Might viewers exposed to publicity come into the film expecting Mildred to be the culprit? 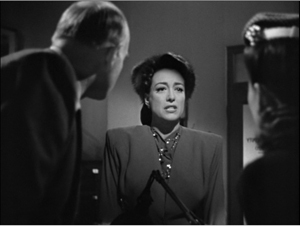 (On Mildred‘s marketing, see Mary Beth Haralovich, “Selling Mildred Pierce: A Case Study in Movie Promotion,” in Thomas Schatz, Boom and Bust: American Cinema in the 1940s (Scribners, 1997), 196-202.) The French poster below seems to put her in a doorway with a smoking gun. Or is that Veda in the doorway? Perhaps the uncertainty of the narration is prefigured by this advertisement. This entry was posted on Wednesday | June 26, 2013 at 8:28 am	and is filed under 1940s Hollywood, Film theory: Cognitivism, Hollywood: Artistic traditions, Narrative strategies, Poetics of cinema. Responses are currently closed, but you can trackback from your own site.